Monday is a penguin who likes to stay warm. His best friends are Yesterday and Tomorrow. They like playing the piano together. They enjoy the spring, summer and autumn. But when winter comes, Monday's house is blown away in a snowstorm. And he is buried in the snow,too. What happens next? This is a beautiful book we found in the library the other week. My daughter enjoyed feeling the snowflakes on the pages.The pages of the book also grow thinner as Monday starts disapperaing. 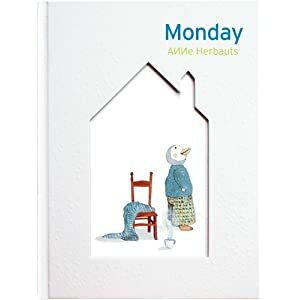 Poetic and tactile book for talking about days, seasons and friendship. Monday can't wait for Tuesday. he doesn't know if Friday will ever come. He is astonished when it's Saturday. On Sunday all is quiet. Which books are you reading with your little ones these days? I would love for you to share your books with us. New here? Please check out this pagefor more information about Book Sharing Monday. I love the illustrations for this book! Looks like a really beautiful book! Sounds like a wonderful book. It would be great for calendar time too. That book sounds very sweet! Thank you to each and everyone of you participating. We really liked the book,I will look out for the writer's other books as well. Oh my the book sounds adorable!! Will have to see if i can find a copy in our library too!!! Nice book. Perfect for the kids. Looks like an excellent book for days of the week practice and lots of fun too! Thanks for your visit to Feed Me Books Friday! Hope you'll be back again next week! I like the book sharing Monday linky. Thanks for hosting it! It looks wonderful. Thanks for sharing with The Children's Bookshelf!